This may be a breakout year for Alexandra Pauline (Sasha) Cohen, the diminutive ballerina on ice who has captivated the public’s eye in the last year. Cohen, who had her 19th birthday party at this year’s Skate America, won her first major international competition last season when she took the ISU Grand Prix Final title in St. Petersburg, Russia. She won her first Grand Prix medal the same season by winning at Skate Canada, then at Trophée Lalique. Under the new Code of Points scoring system, Cohen often scored more points in the free skate than other ladies scored during the entire competition. 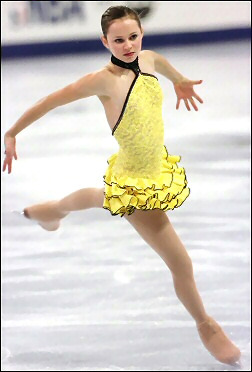 Cohen also took the gold at the 2002 Figure Skating Challenge and the 2003 Campbell’s International Figure Skating Classic. She barely missed a third place finish at the 2002 Olympics and the last two World Championships, placing fourth. She was sixth in her only trip to the World Junior Championships in 2000. At the 2000 U.S. Nationals (her first Nationals as a senior), Cohen won a silver medal, but missed the next season due to a series of injuries. She came back to win a second silver in 2002 and a bronze in 2003. She also won a silver in junior ladies in 1999, but has yet to take the top spot on the podium at any U.S. Nationals. Although she has all the skills, Cohen admitted that nerves had gotten to her in the past. “My goal for this season is to go out and enjoy every performance and not be nervous,” she said. “I’m usually nervous at most competitions, but I want to go out and skate as clean as I do in practice. Tatiana (Tarasova) is always telling me to go out and enjoy it and this year I haven’t been as nervous. I’ve been working hard on a day-to-day basis. I do at least four full run-throughs of my long program every week and the more you go through it, the more comfortable you feel.” Cohen trains for about five hours a day at the International Skating Center of Connecticut with Tarasova. After training with John Nicks in California for many years, Cohen moved to Simsbury, Connecticut to train with Tarasova in the summer of 2002. She is using the same music as last season for her short program. “I used Malaguena when I was in intermediates and I wanted to use it again. I love Spanish music, like Carmen and tangos,” she said. “It’s the kind of music I feel most naturally. It makes me want to get up and dance. I’m not very musical myself in terms of playing it, but I love to interpret it. I can play the piano and the violin a little.” For her new long program, Cohen is using Tchaikovski’s Swan Lake. “Tatiana (Tarasova) brought me the music,” she said. “The cuts were so beautiful that I wanted to use as much as possible.” Tarasova choreographed both of Cohen’s competition programs, as well as her exhibition program to Romeo and Juliet. Cohen was actually a gymnast before she became a skater. “I was in gymnastics from five to seven,” she remembered. “I liked doing the trampoline and floor exercise, but I definitely did not like the bars. One day when I was seven, one of my friends from gymnastics invited me to go skating and I really liked it, so I switched.” Cohen landed a triple salchow when she was 12 and quickly mastered the other triple jumps, except the triple Axel. At 16, she began working on the quadruple salchow, landing her first one in competition at Skate America in 2001. Cohen said her favorite jump changes all the time, but now it’s the toe loop. But she’s never tried a quad toe. She is working on several triple-triple combinations, including triple lutz/triple toe, triple toe/triple toe, and triple loop/triple loop. Cohen has graduated from high school, but she hasn’t picked a post-skating career. “I’ve got a little while to think about it,” she said. “There are so many things I like to do that I haven’t concentrated on just one thing. I’ve got so many options that I can’t decide. I really love fashion though. I can’t sew but I love to design costumes. I designed the yellow dress for my short program this year.” Mare Talbott designed her Swan Lake costume. Sasha Cohen won her first major international competition last season when she took the ISU Grand Prix Final title in St. Petersburg, Russia. Editors’ Note: Sasha Cohen switched coaches (from Tatiana Tarasova to Robin Wagner) less than a week after this article was released.